The final day to turn in funds raised to cover Sugar Creek registration expenses for summer 2018 is THIS Sunday, May 27. Thanks! Join Carla Stanton, member of First, certified spiritual director and mom of three, in room 201 every Tuesday morning, 9–10am. At Parent Share, we pray and talk about raising our children faithfully. Childcare is available. A baptism preparation session will be Saturday, June 2, at 10am in the narthex for anyone who is considering or has scheduled a baptism. To register or ask questions, contact the church office: 608.783.2236 / office@firstlu.org. Sunday, June 10-Friday, June 15. For kids going into grade 8. Our upcoming confirmation students get a chance to start their confirmation journey in the beautiful valley of Sugar Creek. We will learn in faith together while we do Bible study, horseback riding, hiking, swimming, campfires, and so much more! Questions? Contact Pastor Karyn, karyn@firstlu.org. Families of First are invited to Noah’s Ark in Wisconsin Dells. We will be going as a group on FRIDAY, June 15 (not on Saturday, as printed in the newsletter). The park is open from 10am-6pm. Cost: $16, includes hot dog lunch. Katie Everson has volunteered to lead this event for 2018.RSVP to Beth Miller: beth@firstlu.org. Monday, June 18, 11am-4pm, at Viroqua Hills Golf Course. For more info about this event contact Sugar Creek directly: 608.734.3113 / camp@sgrcreek.org. For children entering grades 1-5, on Wednesday, June 27, 7:30am-4:15pm. Why? Experience a day at Sugar Creek (a parent is welcome/preferred)! How: Carpool/van/bus from First Lutheran! Additional info: wear tennis shoes and bring swimsuit and towel. Snacks, lunch and water are provided! Cost: $20. RSVP to beth@firstlu.org. This month’s most needed: Toiletries (shampoo, conditioner, body wash and toothpaste), athletic shorts (men’s and women’s in all sizes), casual shorts in XS and S sizes for guys (27/28 inch waist), gently used athletic shoes. 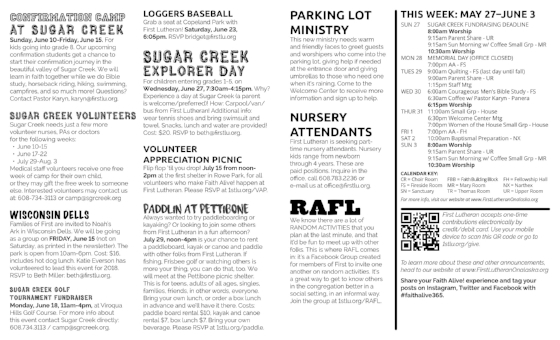 Still time to register for Summer at Sugar Creek!